This year’s Stirling Bull Sales in May will see the inaugural presentation of the Morton Strachan MBE Memorial Quaich. The silver quaich has been created by United Auctions to honour the late leading livestock auctioneer and long-time Board member who sadly died in August 2018. It will be presented as an annual prize for the Supreme Champion Charolais Bull during the May Bull Sales, which take place this year from Sunday 5 to Monday 6 May 2019 at Stirling Agricultural Centre. Morton was a highly respected champion for the agricultural sector with a career spanning more than 50 years. He left school aged 14 to become a trainee auctioneer at Hamilton market and worked in Edinburgh and Cupar before moving to Stirling market in 1958 where he specialised in selling prime cattle. Morton was Managing Director of UA from 1990-95 and, following retirement, remained on the main Board of UA Group PLC until 1999. He continued to be involved with the Bull Sales and acted in an advisory capacity as recently as the construction of Stirling Agricultural Centre. United Auctions is to host a charity auction at Dalmally Auction Mart in support of Scotland’s rural charity RSABI. The auction of an original oil painting will be held during Scotland’s leading livestock auctioneers’ Annual Sale of 1212 Blackface shearlings, aged rams and ram lambs on Saturday 20 October 2018. ‘Market Day at Dalmally’ has been donated by Alan Watson, former Managing Director of United Auctions, who was presented with the painting on his retirement from the Company in 1999 by colleagues and staff. United Auctions is set to host the largest number of pedigree Aberdeen-Angus bulls and females forward at the Stirling Bull Sales in October. Scotland’s leading livestock auctioneers will welcome the bumper entry of Aberdeen-Angus bulls (98) and females (174) to Stirling Agricultural Centre where 771 pedigree bulls and females across eight breeds - including Beef Shorthorn, Limousin, Simmental, Charolais, Salers, British Blonde and Lincoln Red cattle - will be on show and sale from Sunday 21 October to Tuesday 23 October 2018. The Stirling Bull Sales are supported by all-year sponsor Galbraith, the leading independent property consultancy. Raymond Kennedy has been named the top student graduating in 2018 from Harper Adams University’s specialist livestock auctioneering course. The MJ Thomson Award is given each year to the student who is deemed to have been the most deserving after achieving their certificate of higher education in professional studies for livestock market operations and management. Students work towards the qualification over four years while in full-time employment, and is seen as the professional standard for entry into the livestock auctioneering sector. The MJ Thomson award is awarded to a Scottish student while its equivalent is awarded south of the border by the Livestock Auctioneers Association. One of Scotland’s longest-serving auctioneers is to step out of the rostrum in the Autumn. 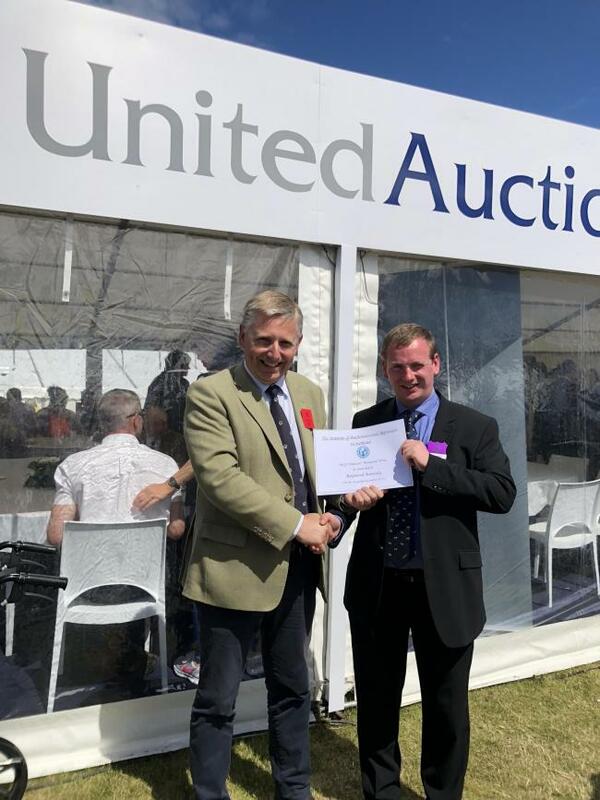 Donald Morrison of United Auctions will relinquish the selling aspect of his role serving the West Coast of Scotland, almost 45 years to the day since he started in the sale ring aged just 17 years old. Stirling Trailer Centre is relocating to a £1million purpose-built facility at United Auctions’ Stirling Agricultural Centre, creating three new jobs and taking their total workforce to 14. United Auctions has enlisted a ‘crack commando auctioneering unit’ to compete in this year’s RSABI Great Glen Challenge 2018 in August. The ‘soldiers of fortune’ from Scotland’s leading livestock auctioneers have come out of the shadows on a mission to raise the most money for Scotland’s rural charity. Now in its seventh year, the annual, one-day, action-adventure event will see teams of four bike, kayak, walk and run a 46km Highland course on Friday 31 August 2018 to help people in Scottish agriculture. The uA-Team stars: team captain Jack Keane as John ‘Hannibal’ Smith on the running leg; Jenna Reid as ‘Face’ will be walking; Murray Steel will be cycling as ‘Howling Mad’ Murdock, and Chris Rogerson as B.A. Baracus ‘ain’t getting’ on no plane’, he’s kayaking. Chris Rogerson / B.A. Baracus said: “Five years ago, United Auctions’ Rostrum Rascals won the trophy. This year the uA-Team ain’t in it to win it; no, fool, we’re in it to raise the money. United Auctions is putting an experienced team of rising star auctioneers at the helm of the Stirling Bull Sales next month. Scotland’s leading Livestock Auctioneers and Procurement Specialists are seeking conscientious and self-disciplined team players to join the Yard function of our Group headquarters at Stirling Agricultural Centre. Scotland’s leading Livestock Auctioneers and Procurement Specialists are seeking an enthusiastic and energetic individual to join our team at Huntly Mart. United Auctions are set to welcome a record number of Salers forward, the first official sale of Lincoln Reds, a new sole sponsor and much more when the Stirling Bull Sales kick off next month. All roads lead to Stirling as the City readies itself for an influx of more than 8000 visitors for United Auctions’ Stirling Bull Sales. The Chairman of Scotland’s leading livestock auctioneers, Neil McLean picked up the award for his ‘exceptional vision and leadership qualities within a pioneering business’. The Board of Oban Livestock Centre is pleased to announce the appointment of United Auctions as new operators of Oban Mart.